In this article, the banking team of jagran josh is providing the complete details of selection process and exam pattern of BOB Manipal PO 2017. India’s international bank, Bank of Baroda requires creative and enthusiastic graduates for the post of Probationary Officer in Junior Management Grade / Scale-I through nine months Post Graduate Certificate in Banking and Finance (PGBDF) course in Baroda Manipal School of Banking. 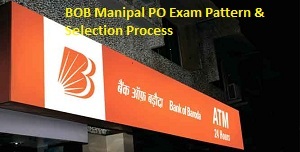 On successful completion of the 9 months Post Graduate Certificate in Banking and Finance course from Manipal University, candidates will be final placed at Bank of Baroda and can get posting anywhere in India as per Banks discretion. However, immediately after joining the Bank, a three months Work Integrated Learning (WIL) in the form of On-the-Job Training will have to be carried out by the candidate at a BOB branch, the completion of which will lead to the award of a Post-Graduate Diploma in Banking & Finance by Manipal university. The course is extendable to a further 18 months of blended learning which is optional at the option of the students and which will lead to award of MBA in Banking and Finance from Manipal University. Minimum Qualification (As on 01.05.2017) - Degree (Graduation) with minimum 55% (50% for SC/ST/PWD) marks in any discipline from a recognized University. The selection process aims to select people who are bright, have good communication skills are dedicated, can work effectively in teams, are passionate about their career goals and who display integrity and a positive attitude. Candidates are required to obtain a minimum score in each test and also a minimum total score in the online test to be shortlisted for Psychometric Assessment, Group Discussion & Interview. Note: There will be a negative marking for wrong answers. The aggregate marks of candidates qualifying in the Online Test will be arranged in descending order in each category and the candidates in the order of merit, subject to approximately 4 times the number of intake in each category, will be called for Psychometric Assessment, Group Discussion and Interview. The Psychometric Assessment will be qualifying in nature. The final merit list for selection will be on the basis of performance in Online Test (objective + descriptive), Psychometric Assessment, Group Discussion (GD) and Interview. Each and every short listed candidates for Group Discussion & Interview has to appear for Psychometric Assessment failing which, candidature of such candidate will be cancelled. The fees for this Course will be Rs. 3.45 lakhs (all inclusive Boarding, Lodging and course fees etc.) plus service taxes. Apart from the above course fees, the exam fees for undergoing various certification exams viz. National Institute of Securities Markets, NISM (Mutual Funds) and NISM (Depository Opns.) as mandated under the course will have to be borne additionally by the candidates, as per the fees charged by (NISM) from time to time for conducting these certification exams. Currently, the fee for NISM (Mutual Funds) and NISM (depository Services) a certification exam comes to Rs. 2500/- per candidate. Emoluments on final placement:- On successful completion of the course, the candidate would be offered appointment in the Bank as PO in JMG/S-I which is presently in the scale of pay Rs. 23700-980x7/30560-1145x2/32850-1310x7/42020. Education Loan Facility: Students can finance the course fees by availing Education Loan which will be granted by Bank of Baroda at a concessional rate of interest of 8% interest. Stipend: A stipend of Rs. 2,500/- amount will be paid to the students during the entire duration of the nine months course of the PGBDF programme. Reimbursements: The fees amount will be reimbursed by Bank after completion of 5 years of service successfully in the Bank. Service Bond: At the time joining of Bank’s services, the candidate will have to execute a service Bond for serving a minimum of 3 years in the Bank w.e.f the date of their joining Bank’s service or else, shall pay back to the Bank the full amount of stipend received by him / her during the program, a notional amount of Rs. 1 lakh towards the cost of on-the –job training and also liquidate the entire Educational Loan outstanding at that point in time at the prevailing card rate from the date of availment. Be ready to grab this opportunity! How to approach Psychometric Test in Bank Examinations?